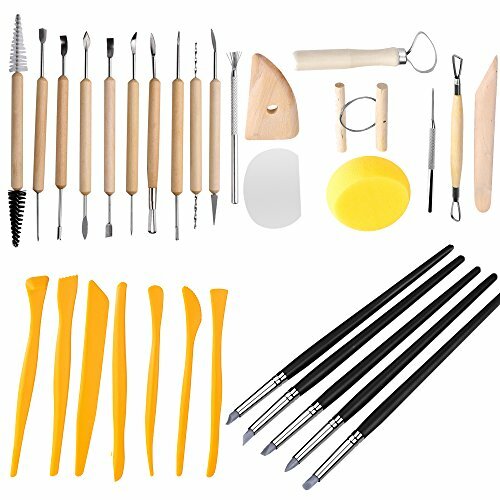 INNOCHEER 31 PCS WELL-MADE SET OF CLAY AND POTTERY TOOLS is ideal for any creative project and for detail work in carving, sculpturing and jewelry making. Each tool is designed to deliver superior results for all modeling clays. These tools are made of metal and some have wood handles. These tools are handy for designing your prototype and creating models to visualize a final product. These tools are great for detail work and any wheel throwing class. This set is made of durable plastic, so you should get years of use. The standard shapes satisfy a variety of modeling needs. This tool set, consists of 5 rubber tip pen, which is best for color shaping, blending, drawing, fine detail, touch-up work and remove the fingerprints. Blades are extremely sharp. Caution: Recommended for Adult use only. Cord poses a potential strangulation hazard to your children. When not in use, store out of children's reach. TOTAL 31PCS CLAY TOOLS: The most sought-after basic tools for a clay/pottery/ceramic masterpiece. WIDE APPLICATION: The clay tools can meet different needs for sculpting, carving, cutting, shaping, modeling, and jewelry making with materials such as clay, ceramic, plaster, mud, and so much more. DURABLE: High quality design for a long-lasting use, easy to clean and store. Sturdy handles that are easy to work with and sharp tools which provide for accuracy and efficiency. GREAT DESIGN: Provides a variety of different carving shapes to give you more flexibility for your designs. Suitable for clay beginners and experts. View More In Ceramics & Pottery. If you have any questions about this product by INNOCHEER, contact us by completing and submitting the form below. If you are looking for a specif part number, please include it with your message. Prima Marketing 655350815356 Iod Vintage Art Decor Moulds - Object Labels 2"